Heat gas or charcoal grill. In small saucepan, combine taco sauce, honey, chiles and adobo sauce; mix well. Brush pork tenderloins with oil. Sprinkle with salt and pepper. When grill is heated, place pork on gas grill over medium heat or on charcoal grill 4 to 6 inches from medium coals. Cook 13 to 15 minutes or until thermometer inserted in center registers 155°F., turning pork once and brushing with taco sauce mixture during last 10 minutes of cooking time. Let stand 10 minutes or until thermometer registers 160°F. Bring any remaining taco sauce mixture to a boil. Slice pork; sprinkle with cilantro. Serve sauce with pork. Pork tenderloin is a lean piece of pork cut from the loin. 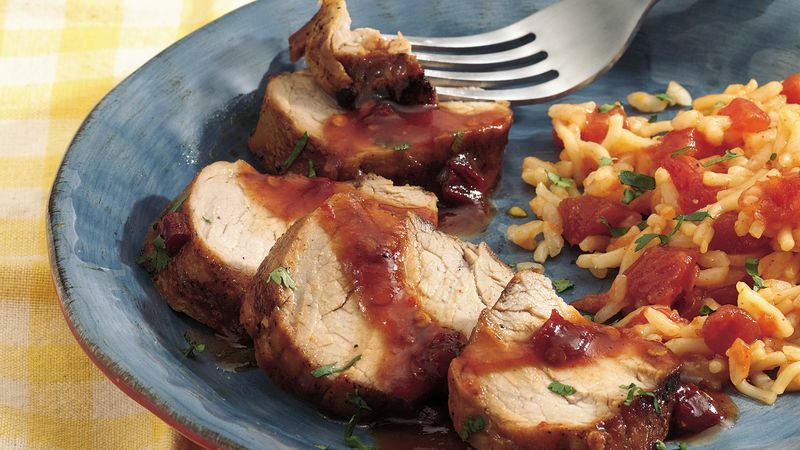 Because this cut contains little fat to moisten it during cooking, pork tenderloin benefits from a glaze or marinade. To reduce spiciness, use only 1 chipotle chile and omit the adobo sauce. To broil pork tenderloins, place on broiler pan; broil 4 to 6 inches from heat using times above as a guide, turning occasionally and brushing with taco sauce mixture during last 10 minutes of cooking time.